I don’t always eat my dinners at Maaemo when I am in Oslo, but when I do it’s fun to bring someone who hasn’t been there before. To celebrate one year since we first met over a glass of Felice from Non Dos, and got ridiculously drunk on a bottle of Fetembulles Pet’ Nat’ from Jean-Pierre Robinot, I invited Hedda to join me. 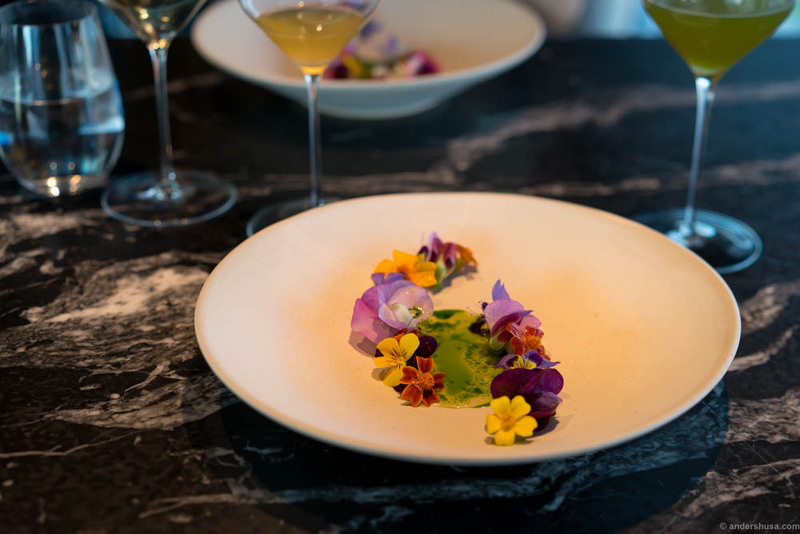 It would be her premier visit to Norway’s first and only three Michelin-starred restaurant – and she knew nothing about it in advance. A table for two was booked at the chef’s table in the test kitchen upstairs. We ordered an Uber Black for the occassion, because you might as well arrive at Maaemo in style when you’re going to blow the big bucks. The first stop was just a few blocks down the road, though, at our favorite wine bar – Territoriet. Magnus Nørsett and Thor was sitting outside. In less than a minute a glass of Champagne was in our hands. Someone had tipped off the girls in the bar about the special day. Magnus was leaving Territoriet two days later to start his new job as head of wine at Maaemo. These two events are hardly related. Our Uber driver was kind enough to wait for us while we enjoyed the drink. Fifteen minutes later I plotted a new destination in my app. For the remainder of the journey Hedda was blindfolded, until she stood on the white steps facing Barcode with “Mother Earth” in clear sight. At the entrance of Maaemo we were met by a new kind of greeting. Head chef Esben Holmboe-Bang and restaurant manager Benjamin Ausland stood outside and waited for us, and the entire front of house was lined up further inside the hallway. This reminded me of the famous “welcome” at Noma, except at Noma all the chefs come out of the kitchen to say hi as well. Well, lo and behold, as we walked up the stairs to the test kitchen all the chefs did indeed come out to greet us. The kitchen in Maaemo is located on the second floor, and the chef’s table has a direct view to the team at work. This reservation is a unique experience and highly recommended if the table is available. 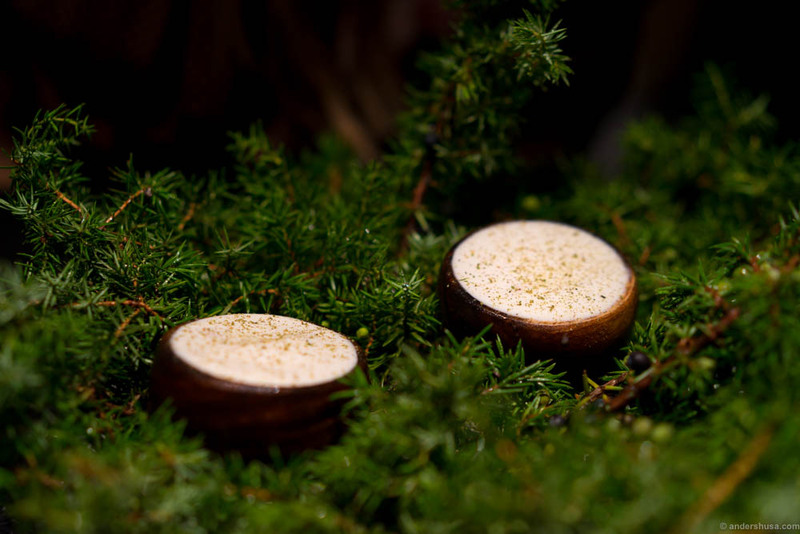 Even though I have been to Maaemo a few times already, I still get butterflies in my stomach every time I enter this mountain peak of Norwegian cuisine. Hedda was experiencing it for the first time, and her face was lit up by pure happiness. There’s so many expressions to take in: the way in which you are greeted like an old friend upon arrival, the elegant interior that surrounds you, the stunning view of Barcode looming in the background as you reach the top floor – and that’s all before you even had a bite of the food. As we sat down we found ourselves just giggling and smiling to eachother. It’s the magic of Maaemo. Esben in a good mood! The restaurant manager, 22 year-old Benjamin Ausland, was our host upstairs and once again did an exceptionally good job. It makes me wonder: Where was I in life when I was at that age? Certainly not leading a three Michelin starred restaurant with a steady hand. Esben did a few appearances too during the meal by presenting some of the dishes, and was in a particularly good mood this evening. In the kitchen, though, he controls his work force with military precision. He shouts and they answer: “Ja, takk!” A welcoming sight was one of the new sommelier in the house – Einar Bakkemoen. He used to work at Statholdergaarden, and spent a few weeks last summer pouring wines at Territoriet. He looked happy to be part of the Maaemo team. 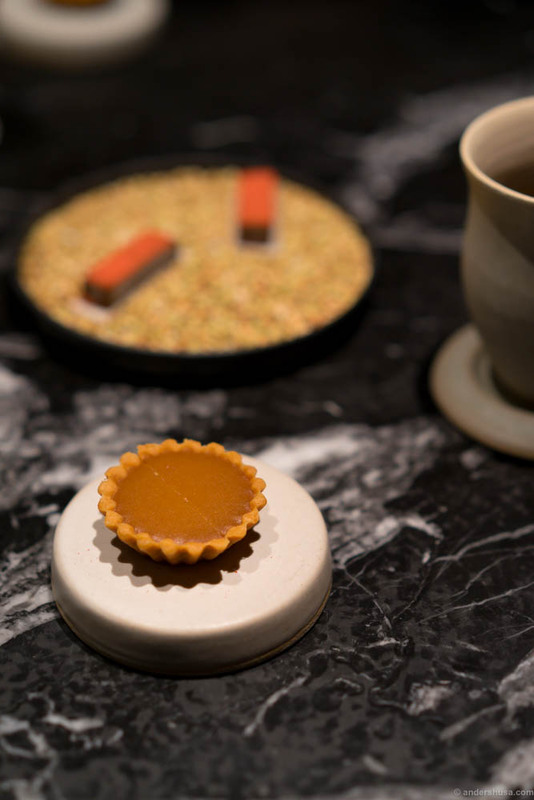 My last visit to Maaemo was in early February, a few weeks prior to the launch of the 2016 Michelin Nordic Guide. Since I had a good feeling that Maaemo would get their third star I had prepared a video from that visit, which I published the moment it was announced on stage by the Michelin Guide’s international director Michael Ellis. I recommend to have a look at that video if you want to get the true sense of what a meal at this level looks like. This latest visit was an evening of celebration and not work. Thus, I only captured a few of the new dishes we got in the test kitchen. You can’t argue that food is not art when a plate looks like this. The classic dishes, like the “rømmegrøt” with shavings of reindeer heart and the browned butter ice cream, were as pleasant and tasty as always. One of my favorite new dishes this evening was actually the first bite: a tartelet with grilled vegetables, flowers and ants. Say what you want about eating ants, but they can give an amazing acidity to a dish if done right. I loved it. The third dish – a potato pancake topped with king crab – had an incredible rich, buttery, mouthfeel. And the kind of flavor you wish would never end. I am glad other people had decided the size of the dish, ’cause I would just have kept on eating more of that. Maybe Esben could make a casual Norwegian taco joint where they served only this? Look at that plate with mackerel and summer flowers, though. If that does not demonstrate how food at this level is elevated to art, then nothing does. It’s so pretty that you want to just give it back to the waiter. “Thanks for letting me have a look.” That is until you taste it, of course. The fresh summer peas and sweetbreads from Anni’s Pølsemakeri was the next highlight for me. 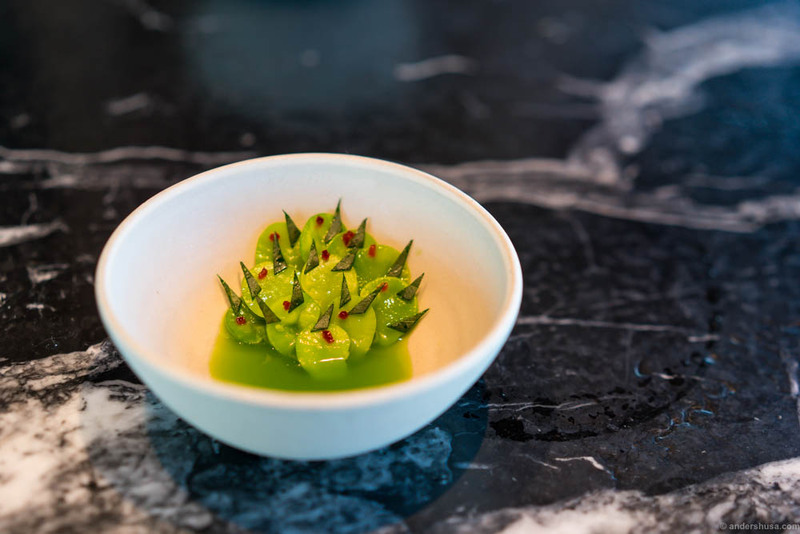 Esben explained: “We’ve chosen to keep the skin on the peas, because the texture when you chew them is so much better then.” He was right. I love sweetbreads, but in this dish they were actually just a supplement to the peas, which are the true shining stars. Benjamin scooping the browned butter ice cream! Benjamin plating the browned butter ice cream! Petits fours. In the back: Norwegian “chocolate” made from buckwheat with freezedried straberry dust. Brown cheese tarte in the front. 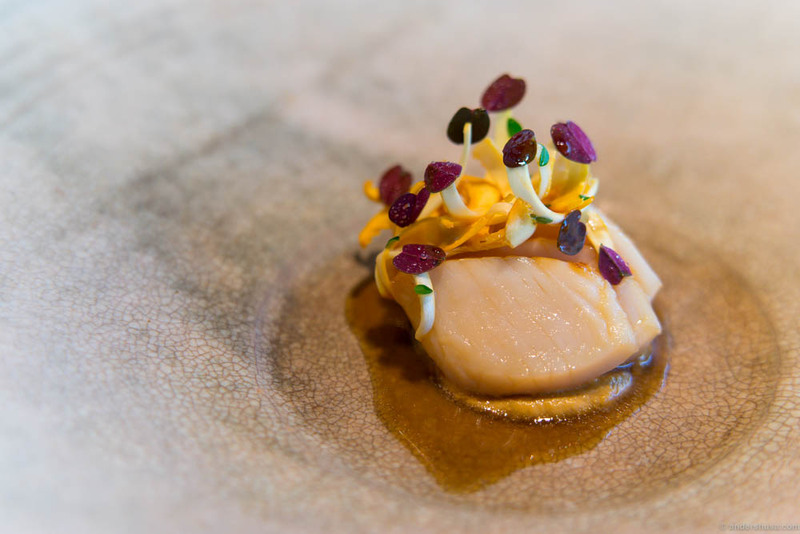 Have you experienced the magic of Maaemo? Please share your story in a comment. I just discovered your website – gorgeous pictures! Very excited to visit Maaemo early next year. How does one make a reservation at the test kitchen table? Hey Yao. Thanks! Just call them and ask. I have been there twice – the autumn of 2012. An experience like no other. Must go back soon. Meanwhile I can avert my eyes from my work computer, turn my head 40 degrees if i feel like it, and share their wiev, from the slightly different perspective of 7 meters above. Or see the staff on the way to their changing room, and get a glimpse of their stockroom in the basement. I work in the floor right above the restaurant! Will dining at the test kitchen table cost the same as dining at a regular table? I have a booking for one november 2. and I’m concidering trying to change to a test kitchen booking. Do you prefer the test kitchen? The price is the same, yes. Just call them and ask if it is available. The experience is different. I prefer it.